Boats by fishermen and tested by fishermen for fishermen; Ranger Tug's philosophy. 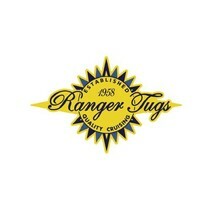 The Ranger Tugs shipyard started in 1968. It is best known for selling reliable, pleasure boats which are comfortable, modern and hold value over time. Founders Nina and Forrest Wood initially started the company by operating a fishing guide service, which gave them the needed experience in boat design. The need for a well designed, comfortable and safe boat was evident and their ample experience helped them in designing a quality fishing boat. Ranger Tug is a company that introduced a lot of industry innovations, from which the following are the most prominent: usage of matching fiberglass trailer fenders, zero ozone depletion floatation foam, hydraulic steering which is standardized for all boats with V6 engines, fiberglass seat components and more. The Ranger Tug R-29 is for sale and represents the company's new tug boat. 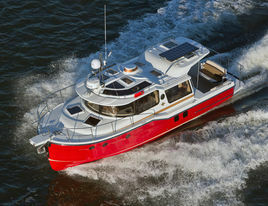 The Ranger Tug R-29 review will delve into details of the boat and how it stacks up with the company’s rich history. The overall length of the boat is 29 feet. 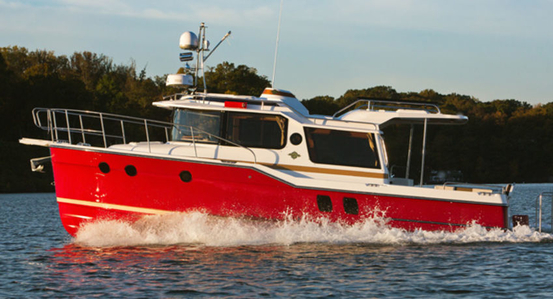 This is the best way to describe the new tug boat from Ranger Tug: a small trawler which holds everything you would find in a much larger boat, perhaps a 50 foot one. People aiming at making a transition from power or large boats will find this trawler very appealing for its easy and affordable upkeep and rich offer. 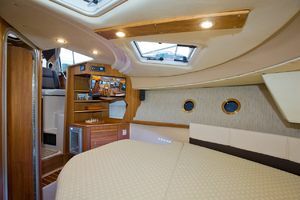 A solid semi-displacement hull made out of fiberglass and a one-piece fiberglass stringer which is tabbed into the hull and coated with foam for sound dampening represent the body of the boat. Needless to say, it is a very tough little boat. The bow of the boat is surrounded by stainless steel hand rails, the side passages of which lead to the cockpit. For people that have been on one of the Bayliner, Regal or Reinell boats, the similarity will be uncanny. This is because David Livingston was the chief designer for the Ranger tug R-29. A practical mix of useful layouts, storage compartments and performance enhancing design are what Livingston’s design is all about. The R-29 builds upon his successful predecessor the R-25 with a similar on-deck layout. The cockpit is a typical example of the practical approach of the designer. There are foldable benches on both sides which are dipped in brown and white tones, the stainless steel bar has an easy pull out mechanism which enables comfortable seats to easily slide in and out. At the far end, there is another couch area with stainless steel handrails going around all sides. On the floor, between the sitting areas, are hidden compartments, one of which hides a useful table which shares the color tone of the floor. The other compartments hide the boat’s electronics and the boat’s engine. One of the compartments hides batteries and chargers, a 4kW Mase Genset or a 2000 watt inverter and electrical switches. The centerline hatch hides the 260 hp Yanmar engine with a nice approach to the engine from all sides. All though it does extend under the main cabin, fluids can be checked via a dedicated hatch. The Ranger Tug 29 stern can be reached through a small gate at the back end. The platform at the stern has a sitting area ideal for anglers with a red toolbox underneath the seat, for tackle or general tools. 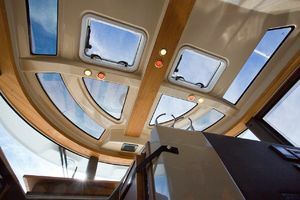 Foldable stairs are hidden underneath a compartment, this full-width swim platform can be used for boarding, but one has to go through the starboard transom gate. The other option for boarding is the side aft molded stairs; whichever route one chooses, the designers made sure that enough stainless steel railings are present. 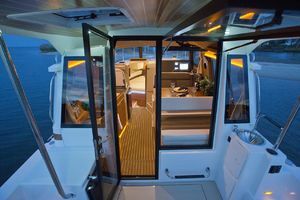 Entrance to the galley of the Ranger Tug 29 is through a glass door at the cockpit, behind which is a small ice box which is ideal for drinks or small meals. 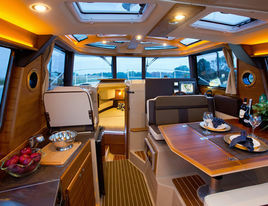 On the right-hand side of the galley is the lounge and/or dining area with a nice two-sided couch and a foldable table. Light abounds from all sides with the spacious windows; opposite the lounge area is the kitchen area. A drawer cabinet is right next to the entrance door with enough space for all the necessary kitchen utensils, next to it is the oven with cookers. A sink is also present with another cabinet which has a marble work surface; a foldable wooden platform is also present which is ideal for holding dishes or for cutting. The helm station is located right behind the lounge area with a steering wheel right in front of a couch which can accommodate two people. The screen, joystick control, and gears are closer to the window and that space is designed for the captain. The windshield is cleaned nicely by four windshield wipers which work in unison to enhance visibility. Opposite the captain’s station is another seat with a foldable table in front of it which is ideal for a one man dinner. The master cabin can be reached by using the stairs down next to the helm station. Practicality is stressed here as well. A large twin bed is located in the middle of the room and takes up most of the space. The front part of the bed can be raised to reveal a storage space, opposite the bed is a wall mounted 19’ LCD TV screen with a CD/DVD player which is perfectly positioned for viewing pleasure. Light enters the room through two overhead shafts. On the left-hand side of the bed is a foldable desk. The master head is on the right-hand side of the entrance into the room. A toilet bowl, two mirrors, and a shower complete the offer of the head. The sink is located on the marble covered work surface with towel holders on both the right and left sides. It’s a very practical head in a small space. 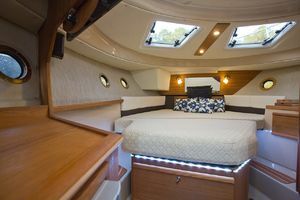 The guest cabin can be reached from the galley and is a very tight space, but it serves its purpose. 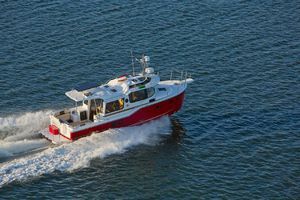 The Yanmar 260 hp 6BY2 engine offers a top speed of 15 knots, the initial pre-start checks on this engine are quite straightforward as well as the maintenance. This Swedish engine has a reputation for reliability and longevity. A fuel tank of 120 gallons of fuel is standard along with an additional 30-gallon supporting tank for the Genset. In case of an emergency, the fuel can be transferred into the main tank. 70 gallons of fresh water and a 40-gallon holding tank complete the offer. The Ranger Tug R-29's price is adjusted so that everyone has access to this boat dedicated to cruising and relaxing with the all the necessary equipment. Six batteries offer peace of mind when going for extended periods of time away from the shore, especially with the charging and inverter system that the boat offers. Additionally, anchoring is made simple with the anchor locker at the front, a stainless steel bow roller and a Lewmar electric windlass with the controls at both the bow and the helm. Efficient and relaxing cruising just got a new name: The Ranger tug R-29. This boat is for sale, and if you’re looking for a unique boat which is not only solid and well built but also flamboyant, then look no further. Get in touch and get all the info you need to buy this beauty!